The Indian Air Force Thursday said it is very happy that captured pilot Wing Commander Abhinandan Varthaman is returning home but dismissed suggestions it was a goodwill gesture, insisting it was in line with the Geneva Conventions. 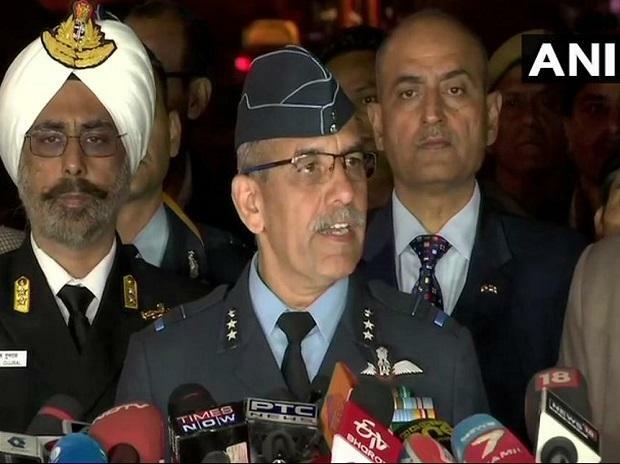 "We are very happy Abhinandan will be freed tomorrow and look forward to his return," Air Vice Marshal R G K Kapoor, assistant chief of Air Staff, told a news conference. Varthaman's MiG 21 was shot and he bailed out after bringing down two Pakistani F-16 fighters during a dogfight to repel a Pakistani attack on Wednesday morning, he said. He has been in Pakistan since then. Pakistan Prime Minister Imran Khan announced in Parliament on Thursday that Varthaman would be released on Friday as a "peace gesture". Asked if the IAF sees it as a goodwill move, Kapoor said, "We see it as a gesture in consonance with the Geneva Conventions." He was addressing the media along with the representatives of the Army and the Navy, who both said the armed forces are on high alert and ready to meet any security challenge on land and sea. Tensions between the two countries escalated after Indian fighters bombed terror group Jaish-e-Mohammed's biggest training camp near Balakot deep inside Pakistan early Tuesday. It came 12 days after the JeM claimed responsibility for a suicide attack on a CRPF convoy in Kashmir, killing 40 soldiers. Kapoor said it was up to the political leadership to decide when and how to release evidence of the Balakot strike's success. He was responding to a question on the scepticism in some quarters about whether IAF fighters had hit the intended targets. Kapoor said there is credible information and evidence that "we hit the intended targets" and it was premature to assess the casualties and damage. The IAF showed parts of Amraam missiles as proof that Pakistan used F-16 aircraft to attack Indian military establishments on Wednesday. Pakistan lied that no F-16 was used but there was enough evidence, Kapoor said. Stating that Pakistan aircraft targeted military installations, he added that PAF bombs were unable to damage any of India's defence installations. Addressing the gathering, Indian Army's Major General S S Mahal said escalation of tensions had been done by Pakistan but India was prepared for any contingency if the enemy provoked it. Mechanised forces were put on standby and troops were ready to deal with any security challenge, he said. Rear Admiral of the Indian Navy Dalbir Singh Gujral said the force was in a high state of readiness to deal with any Pakistan maritime misadventure.